One of the biggest challenges for brick and mortar retailers is translating footfall into sales. It’s a familiar scene for many businesses: the store is heaving with people, staff are busy assisting customers but the sales data from the day is truly disappointing. 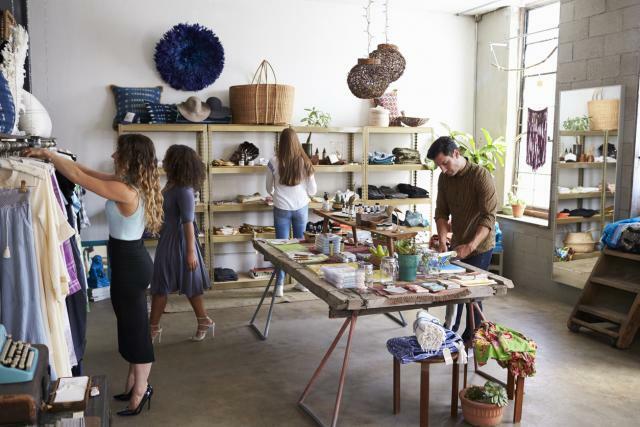 Getting visitors into the store is only the first hurdle for retailers, getting them to convert in-store and purchase goods is the next challenge. However, there are some tricks of the trade that can subtly push your visitors closer towards the till. These small changes can bring big results without a total overhaul of the business. Busy stores can make an unpleasant shopping environment for customers who are looking to be delighted in-store. They want convenience and speed at checkout, a large queue is off-putting and will turn an impatient or busy customer towards the door. You can hide queues by placing the register at the back of the store or hidden around a corner. This is a ploy used by many large retailers, with the registers placed at the back so the customer is also forced to walk through the store and view more products before making their transaction. A win-win from a design perspective. Most people notice a few songs playing as you wander into a store. The music being played isn’t merely there to create the right ambience, it’s a subtle tool used to increase sales. Yet, it isn’t quite as simple as play any old song and sales will increase. Each genre can have a particular effect on visitors, depending on your goals and target demographic you can use music tactically. Loud music gets people to move through the store quicker, while slower and quieter music makes customers stay longer in store. Pop music is understood to trigger more impulse purchasing. Each demographic responds to differently to music too. Background music allegedly leads older customers to shop for longer and purchase more, whilst foreground music is said to have the same effect on a younger audience. Most stores schedule their staff according to their data on sales. On days when there are typically a large number of sales, the shop floor is filled with a greater number of staff. Yet, this approach doesn’t account for days where there were low conversions and a high number of visitors. Structure your staffing schedule inline with footfall, days the store is busiest will not necessarily be the days you see the most conversions. By ensuring there is always the right amount of staff to assist customers you are likely to see an increase in sales. This is a key technique to get visitors to stay in the store for longer. Giving away drinks, nibbles or free samples creates a welcoming and pleasant atmosphere for customers. There is also a key psychological motive for handing out these treats. Behavioural economists highlight that the instinct for reciprocity is very strong. When given a free sample, customers often feel obliged to do something in return. Even if you can’t give away samples of your product, you can think of a type of service to provide your customers. Many makeup brands offer free makeovers for customers as they know it is rare that a consumer doesn’t buy something after such a service. Fears of low stock supply are a well-known psychological trick for pushing customers to convert. A feeling of scarcity around a particular product incentivises customers to purchase before the product is gone. Reducing the amount of merchandise on the shop floor is one way to achieve this, a lack of stock can lead customers to feel this is the last one in stock. Scarcity will make each item appear like a more unique offering. You may find you have customers coming in-store on their lunch hour and are tempted to purchase an item but don’t want to be tied down to carrying the item. Offering delivery on particular packages may be an easy way to drive conversions, it complements the magic of the in-store experience with the convenience of online delivery. The importance of getting the last mile right, should not be underestimated. As we’ve written before, increase sales last mile. If you would like to learn more about the last mile solution that will increase sales, click here. Although some of these techniques may work wonders for your business and increase sales as you’d hope. It’s important to assess how much your conversion rate could be improved by. Without doing these initial sums, it’s hard to quantify how much your business could gain from a new approach. Start with calculating your current conversion rate. You’ll need an idea of footfall - you can work this out manually, asking an employee to do this or if your footfall is too large you could consider installing a device to manually count it. Remember this is always a close approximation. Once you compare the number of transactions with visitors on a particular day, you’ll be able to calculate the conversion percentage. The more granular you can get with this data, the more informed you can be about your store’s potential. You may notice the conversion rate is much improved when there’s more staff available to assist customers in the evening when the store is relatively quiet. Use the numbers to inform your business and drive positive changes in-store.